The spam-mail boom of the near future: The great advances of technology, a new generation of improved systems, and ideal computer programs have caused a backlash. The IT world has advanced significantly to the point where humanoid "Spam" mails are causing trouble for their humans. In the near future, hundreds of thousands of spammers have caused incalculable destruction to the mainframe of the lives of everyday citizens. Enter "SM" Hunters to save the humans from our own creations. Can "Spam" ever be good? This series was a lucky find for me. I usually go down lists of mangas, trying out each one, and I happened to come across this one. The description initially kinda threw me off since it was so weird and new, I mean, what did it mean by spam? So I gave it a shot since I had nothing else to read, and I ended up staying up all night finishing it one shot. 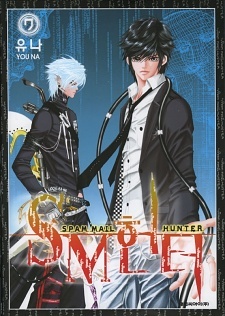 And wow, seriously give this manhwa a chance if you are into action, shoujo, scifi, bishies, or just need something new. The plot line is enough to keep you going since it diverges from the boring clique shoujos, and since its sci fi, it's cool to see futuristic problems that they face that we may come to realize as well. As for the art, it's similar to that of Gong, but you could also see that the author put a lot of time and detail into it (esp. into the hot male protagonists ^_^). The characters are well developed and unique and the heroine actually doesn't make me cringe or want to throw something against the wall.